Spartina alterniflora. By Joseph DiTomaso. Copyright © 2015 CC BY-NC 3.0.www.bugwood.org (Accessed 8/2015). Spartina alterniflora is a perennial C4 grass (Boyle and Patriquin 1981), 50 cm to 2.5 m tall, clonal from long, soft, stout rhizomes; stems large, coarse, fleshy, spongy, often to 1 cm diameter, sulfurous when bruised; disintegrates quickly in winter. Leaves alternate, flat, 0.5-1.5 cm wide, smooth, thick, tough. Flowers dry, papery, spikelets about 1 cm long, 1-flowered; inflorescence narrow, pale tan, shaggy, 10-30 cm, spikes 5-10 cm long, appressed to inflorescence axis; blooms and fruits July-Oct. (Hough 1983). Fruit dry 1-seeded. Seeds eaten by songbirds and waterfowl (Martin et al. 1951). 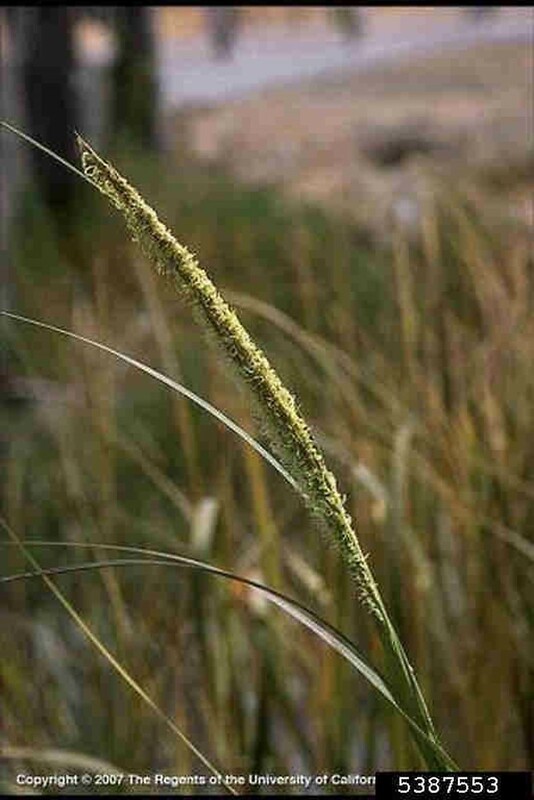 Spartina alterniflora. By Marilee Lovit. Copyright © 2015 Marilee Lovit.New England Wild Flower Society.gobotany.newenglandwild.org (Accessed 8/2015). 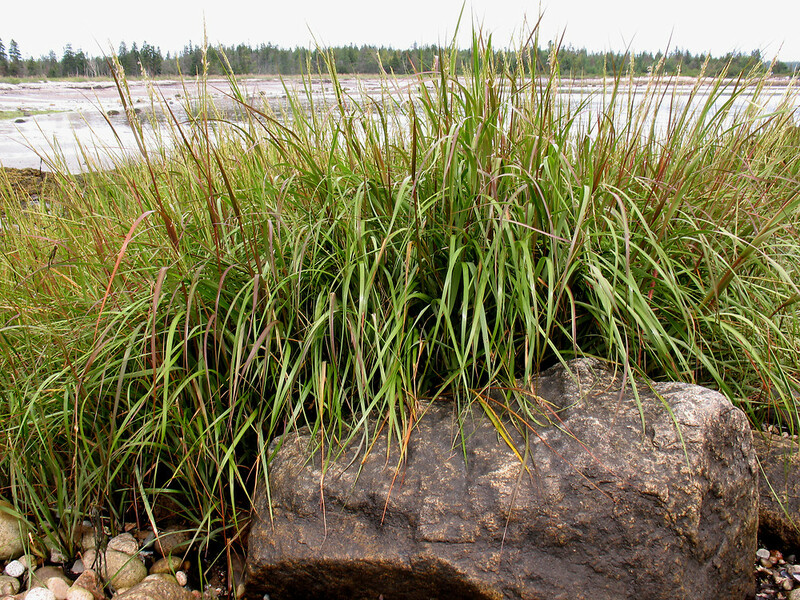 Habitat: Low salt marshes (midtide to mean high water) and along tidal creeks where salt water regularly inundates plants and soil is always saturated. Salt tolerant. Tolerates fire, salt, soil pH 3.7-7.9, intolerant of shade (USDA, NRCS 2010). 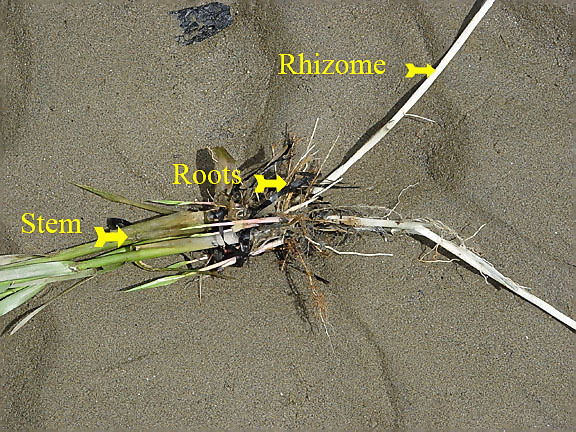 Spartina alterniflora anatomy.Robert Zottoli.zottoli.wordpress.com (Accessed 3/2017). Notes: The peat formed by Spartina roots stabilizes shore areas and decreases the destructive force of storm tides and wave action. It also moves oxygen into its root zone and may support bacteria that degrade oil contamination from spills. Spartina detritus is the major carbon source for salt marsh dwellers. It supports the entire salt marsh food web from bacteria to fish. Rhizomes and new shoots eaten by geese and muskrats (Martin et al. 1951; Bergen et al. 2000).